Ahmad Afif Amran enjoyed a competitive if not lucky start as he topped the CP130 opening practice for Round 6 of the PETRONAS AAM Malaysian Cub Prix Championship in Kangar, Perlis on Saturday. Refreshed from the long-season break, the PETRONAS Yamaha CKJ rider recorded the quickest lap in 42.828s early into the session but a misunderstanding with the team saw the Terengganu rider pit-in just after three laps. Fortunately for them, the rest of the CP130 field struggled to find a competitive pace including championship leader, Ahmad Fazrul Sham (Yamalube AHM) who crashed twice throughout the practice. The seasoned contender however escaped both crashes without any injuries and was able to complete the session fourth with a best time of 43.220s. Azhar Abdul Jalil (Motul Yamaha YY Pang) logged in the next best effort after Afif in 43.131s with Affendi Rosli trailing in third, 43.187s. “But I have to thank my lucky stars as the rest of the field was having a hard time putting out hot laps. 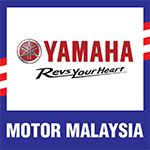 Partly because the team had already found a strong setup in the free practice and I understood the Kangar layout very well having jogged around it a couple of times yesterday,” he added. Currently Afif is ranked eighth overall in the CP130 standings with 38 points while Fazrul Sham leads with 70 points.